This elegant combination of a basic white fish like cod with a simple butter-based sauce is a starting point for any number of variations. Try it with swordfish, snapper, flounder or any fish with a relatively high-fat content, as lean fish are more prone to dry out when baked. Here's the recipe for the beurre blanc sauce, of which you'll need about a cup. Following the main recipe below, we've provided a few notes discussing the process for making beurre blanc. It's not especially complicated, but it can go wrong, mostly if your butter isn't cold enough. 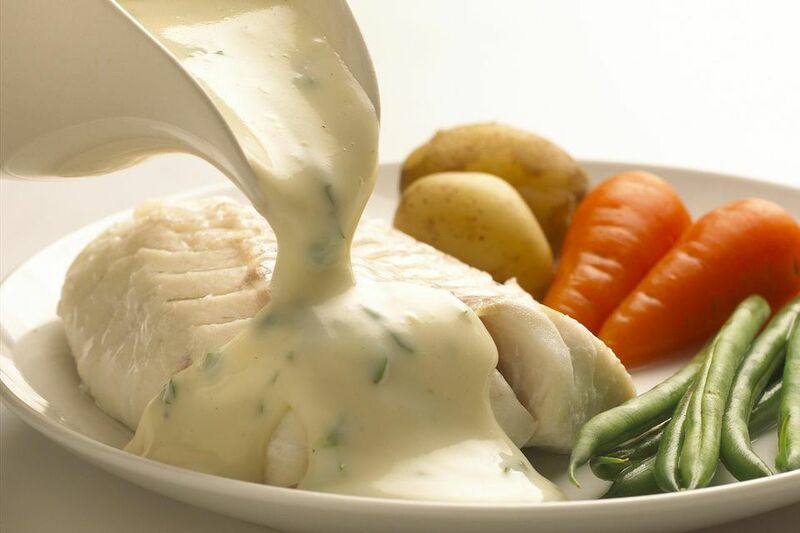 Still, once you've mastered the beurre blanc, you'll find that it's a lovely sauce to go with many different types of fish and seafood. Arrange cod fillets, skin down, on a baking sheet lined with a silicone baking mat. With a pastry brush or even a paper towel, brush the fillets with lemon juice and then melted butter. Season with Kosher salt and with a pinch of white pepper—about the amount of pepper you can pick up between your thumb and forefinger. Bake until the fish is opaque and is just beginning to flake, 10 to 15 minutes or so, brushing once with more melted butter about halfway through the cooking. Serve topped with hot beurre blanc sauce. Note: Beurre blanc is an emulsified sauce made by first reducing wine, vinegar and shallots in a saucepan until nearly dry, and then whisking in cubes of cold butter. Cut one pound of butter into cubes. Keep the cubes very cold. This is important. Heat a cup of dry white wine, half a cup of white wine vinegar and one tablespoon of finely minced shallots in a saucepan. Bring it to a boil, then lower the heat and reduce it to about two tablespoons. This will take about 10 minutes. Now start adding the cubes of butter directly into the saucepan one or two at a time, whisking until thoroughly incorporated before adding more. When you're down to your last few cubes, remove the sauce from the heat. It's up to you whether to strain out the shallots or not. Traditionally this was done, but it's not essential. Serve it hot. If the sauce does start looking like melted butter, it's because your emulsion broke, and the likely culprit is either that your butter wasn't cold enough, or you added the butter cubes too quickly, or you didn't whisk hard enough. To fix it, take the sauce off the heat and whisk in a few chips of ice until the emulsion comes back together. Voilà! You're a chef now!